As the weather is getting colder, I am looking forward to making more soups, especially chili. The only problem I have is that most of the chili recipes I have begin and end with a chili packet. I know, I know – that is truly terrible, especially coming from someone who cooks just about everything else from scratch. Since my husband like a variety of different types of chili, I decided to do some research and try finding some awesome chili recipes. 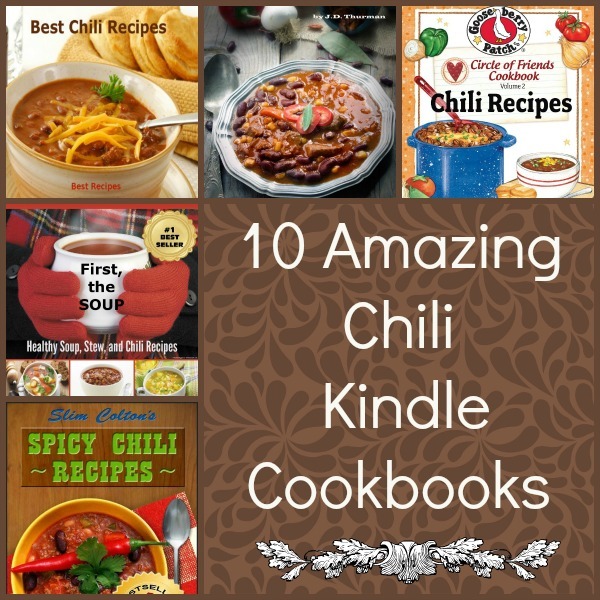 Knowing that many of you love cookbooks as much as me, I included some of the best chili cookbooks available on the Kindle below. Get the Five Alarm Chili Cookbook for only $.99. Meals to warm your palate while you sit by the fire and read a good book. Chili recipes that are different, unique ingredients and heat levels to spice up blah, don't know what to cook days. Get 50 Chili, Soup and Stew Recipes (Delicious Non-Vegetarian Diabetic Recipes for Working Women) for $.99. According to statistics there's definitely a rise in numbers of diabetic women. Being diagnosed with diabetes is a challenge, but it's indeed more difficult if you're a woman juggling life and work. If you're a working woman diagnosed with diabetes and you're always stressed out on what meals you should eat every day because of your busy schedule, then this book is definitely for you. You will get to learn pretty exciting and definitely healthy and delicious quick and easy recipes in this book that you'll surely love. Try out the recipes found in this book today and choosing to be more productive at work and stay well and healthy! Get the Circle of Friends Cookbook 25 Chili Recipes for only $.99. Warm up your family on the chilliest days with these 25 tried & true recipes for hearty, zesty chili of all kinds…from Chili With Corn Dumplings and Slow-Cooker Steak Chili to Creamy White Chicken Chili and Rio Grande Green Pork Chili, you're sure to find a favorite! Get this Chili Cookbook for just $2.51! Originally $2.99. Get a taste of Gooseberry Patch in this collection of over 20 favorite chili recipes! Grab a spoon and dig in! Warm, hearty and oh-so-delicious, we've included plenty of recipes for your one-pot family favorite in our Chili cookbook. Try southwestern chili casserole, Grandpa's favorite chili and oh-so-cheesy chili dip. Get 35 Chili Recipes – World's Best Chili Cookbook (Hillbilly Housewife Cookbooks) for $2.99. Chili is an easy and versatile dish. You can make it with all different kinds of meat such as beef, turkey, chicken or venison. You can also make it with or without beans. You can also make it as spicy as you like. In other words, it’s a simple recipe that you can tweak to your liking. Get Best Chili Recipes for $2.99. A warm bowl of chili is a welcome meal any time. Now you can bring home the world's best chili recipes that are enjoyed by chili lovers everywhere. Get Slim Colton's Spicy Chili Recipes – Limited Edition for $2.99. It’s hard to imagine a more perfect food than a nourishing bowl of chili. It’s a hot and hearty meal that fills you up and really satisfies. It’s also economical and easy to make. Have it for dinner tonight, lunch tomorrow, on camping trips, tailgate parties, or any time you want a quick and easy dish that you can make ahead of time and quickly reheat. Slim Colton’s chili recipes are high in vitamins and minerals, low in sodium, and a great source of protein and fiber. Get Uncle Zeke's Chili Parlor (recipes for the chili enthusiast) for $2.99. Are you tired of the same old chili? Uncle Zeke says spice it up! Although the taste of chili lends itself wonderfully to a blustery, cold winter night I can tell you that it tastes just as good in the blazing heat of a Texas summer. Hot or not, true chili fans find comfort in the fragrantly spicy, familiar aroma of a great pot of chili with these recipes that are easy enough for any chili enthusiast. Get Recipes for Chili Lovers – A Delicious Fare Cookbook for $2.99. Here at Delicious Fare Cookbooks, we’re dedicated to bringing you the best recipes at the best ebook prices. Cooking great food shouldn’t be expensive, and recipes shouldn’t be either. That’s why our line of ecookbooks is always priced low, and will always be a good value for you and your family. There are NEVER any ads included in our ecookbooks, so we can bring you the easiest, best recipes without unnecessary interruption.The clickable table of contents at the beginning of the book make it easy to find specific recipes. Get First, the Soup: Healthy Soup, Stew, and Chili Recipes (a Scrumptious Low-Calorie Recipes Cookbook) for just $2.99. Several studies have shown that people who consume soup before a meal eat measurably fewer calories during the meal than those who have nothing prior to mealtime. Soup can be filling and satisfying without having an excess of calories. It can, in itself, be a meal (or a snack). This cookbook has soup recipes which are generally lower in calories than their full-calorie counterparts. Avoiding fillers such as cornstarch and including healthy ingredients makes them more nutritious and less fattening. Even better, the recipes taste great, too! Time after time I've received compliments on these recipes from people who are watching their weight, and people who aren't (and seem surprised that they're eating a lower-calorie recipe). I love a good bowl of hot, spicy chili with crackers,cheese and sour cream. Not the biggest fan of spicy food, but I know people that are so this is great! This post is a great resource for our Dental School chili cookoff contestants!!! Chilli , My favorite any time of the year thank you for sharing these have already got my kindle and ready to download these . I love chili, the hotter the better. Especially the way my husband cooks it. We use both ground meat and beef tenderloin. Fresh tomato,peppers and ancho. Yummy! My whole family love chili and I really don't know how to make it well. I would love to find a good recipe that my whole family would eat. These are all great variations on chili!